It’s snowing and cold and nasty outside. The rec center in my town has an indoor track, but it’s 15 miles away from work. 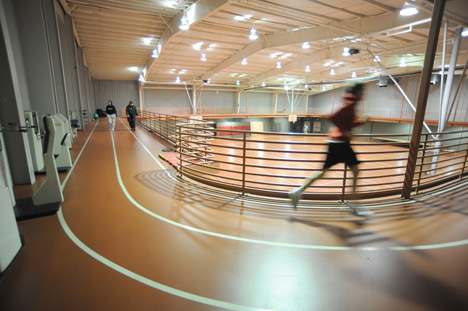 The Bob Burger Recreation Center in Lafayette is only 7 miles away from work, and it has an indoor track, too. So I bundled up and drove over there during my lunch hour, handed over my $5.00, and asked the way to the indoor track. That’s when everybody behind the desk got the scared face on. The one they get when they know they should be accessible, but aren’t. The indoor track is on the second floor, and “this building was built long before we had to do that stuff.” God, that excuse gets old. Search engines of the world: the Bob Burger Recreation Center in Lafayette, Colorado is not wheelchair accessible. We may be moving to your area, or at least not far–my husband’s at least applying for jobs there near family. Would you mind answering some questions about housing/neighborhood accessibility if you have a chance? I don’t want to take a lot of your time but I have a few questions. I can be reached at fridawrites, gmail.